As revealed in the survey, Canadian eBusiness Managers have many of the ingredients for success at their disposal. They generally have full responsibility for strategic and operational aspects of their eBusiness, including financial. They are broadly educated, skilled, visionary, and have no lack of access to specialized eBusiness talent and resources. And they have no lack of confidence in their abilities to manage their eBusinesses. So why are most Canadian eBusiness Managers such underperformers relative to their US and global competition? What’s holding them back? In our opinion, executive management and eBusiness management are often NOT speaking the same language. The survey indicates that a surprising 40% of eBusiness Managers in large companies indicate that they are NOT “getting the necessary leadership from the executive team”. Follow-up comments from eBusiness Managers point to a surprising lack of understanding by traditional executive management of eBusiness dynamics and opportunities. A 2011 study by eConsultancy4 on Digital Organizational Structures indicates that digital training continues to be a relatively low priority for organizations outside of the digital departments. In our opinion, high-level executive education should be a priority – certainly not to turn executives into digital specialist – but to equip them with the knowledge necessary to provide leadership for online initiatives and strategies. On the flip side of this “speaking the same language” issue, the study also revealed a common frustration by eBusiness Managers in building online investment proposals that resonate with traditional executive management. From our experience, many eBusiness Managers do not know how to employ the predictive analytics (see Analytics section in this report) needed to make compelling investment pitches that focus on credible financial payback for key eBusiness initiatives. And so, as much as corporate executives need to become more comfortable with the language of eBusiness, eBusiness Managers also need to become more comfortable with the language of the corporate executive – especially ROI, NPV, and Risk Mitigation. Another surprising finding is the lack of integration between offline and online business units in “bricks and clicks” organizations. Over 65% of large eBusinesses surveyed indicate that their online businesses “are not at all or only loosely integrated” with their offline counterparts. Integrating both online and offline businesses is often made difficult by legacy technology, processes, and cultures on the offline side. Moreover, follow-up comments by eBusiness Managers indicate that the traditional offline side of the business “still calls the shots” for the online business via corporate strategies and budgets. In our opinion, companies need to put the online part of the business on more even footing with the offline traditional businesses. This is especially critical as the customer journey evolves to become a more integrated combination of online and offline activities (e.g. ROPO – research online purchase offline; Showrooming – in-store use of digital devices). 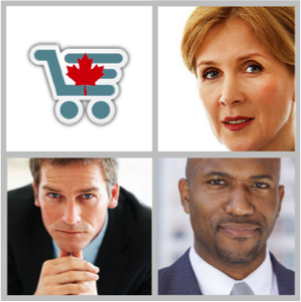 Are Canadian eBusiness Managers overconfident?